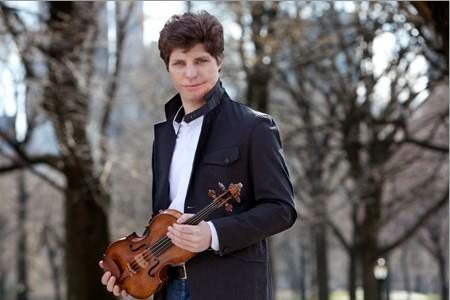 Today is the official CD release of Augustin Hadelich's new recording, Echoes of Paris, which was released digitally about a month ago. For the new recording, in collaboration with pianist Robert Kulek, Hadelich performed with the Gingold Strad. The CD contains Francis Poulenc's Sonata for Violin and Piano, Op. 119; Igor Stravinsky's lesser-played "Pulcinella" suite called "Suite After Themes, Fragments And Pieces By Giambattista Pergolesi"; Claude Debussy's Sonata for Violin and Piano in G minor and Sergei Prokofiev's Sonata No. 2 For Violin And Piano In D Major, Op. 94b (originally for flute). "I really enjoy these pieces and thought that they fit really well together," said Hadelich, speaking over the phone from his home in New York last month. "That is what I started out with. And then it occurred to me later that all these composers have strong relationships with the city of Paris." "I thought a little bit more and realized that you can hear how they influence each other. You can hear a little bit of Debussy in Stravinsky and Poulenc… They were all in Paris at some point, going to each other's concerts. They would all show up to premieres of other composers' newest works… They didn't necessarily they all like each other; they were very critical of each other sometimes. Nevertheless, you can hear a general influence." "In Poulenc's case, he was very influenced by Stravinsky, the percussiveness in the writing," Hadelich said. "That comes out in the percussive opening of the violin sonata." Poulenc was very critical of his second violin sonata, which was written as a tribute to the Spanish poet, Federico García Lorca, who was executed in 1936 by the fascist government in Spain. "He was a very self-deprecating person, really self-critical," Augustin said. "I think he was torturing himself about the form of it, which is unusual and a little bit strange. Sometimes his music can be a little fragmented. But actually I like it, it makes the sonata very unique. I like the sudden changes, the sudden back and forth between these incredibly contrasting elements, this really aggressive, percussive writing and that sort of cheesy salon music – there's a lot of contrast in this piece, it's extremely exciting." When it comes to the Stravinsky piece that is based on his ballet, Pulcinella, violinists tend to know the Suite Italienne, which was transcribed in 1932 by the violinist Samuel Dushkin. For this recording, Hadelich and Kulek perform a 1925 version, made by Stravinsky in collaboration with the violinist Paul Kochanski. "I played 'Suite Italienne' a lot, but then I suddenly stumbled upon this earlier version," Augustin said. "I decided that it's more authentic, it's more Stravinsky. In the other version, sometimes it doesn't really sound as though you're playing Stravinsky because they took so many of the dissonances out. It's no longer really neoclassical; it just becomes sort of classical. The later one is also very beautiful, but this one is a little quirkier and much more similar to the orchestral version. I also think that the two instruments are a lot more equal than in the earlier one. The violin doesn't have the theme all the time, there's a little more switching back and forth. It's also much more difficult." "There are some movements in particular that are much more interesting," Hadelich said. "The second movement, the Serenata, has a lot more interesting colors and effects, and then the second variation of the Gavotte, the fourth movement, is longer and the writing is a little bit more imaginative. It sounds a little like a music box -- the piano is playing very high and the violin has harmonics. It's a really magical passage, and it goes on longer than in the later version...it became one of my favorite parts. " The Prokofiev flute-gone-violin sonata is actually one of my personal favorites, and after seeing Augustin perform it live in LA a few years ago, I was inspired to dust it off and play it again myself! So how are things going, with that new Strad? "I'm really enjoying it," Hadelich said. "The old one was always really wonderful for recordings because it has such a beautiful sound, but I think the new one has that sound, too, and in the concert setting it's quite a bit more powerful. It's been easier with certain pieces, such as large dramatic concerti like the Brahms concerto. Also, it just has a really gorgeous sound. It's little bit brighter than the other one, but I think actually it fits my playing a little better. It's less temperamental with the travel, which makes everything easier. The other one would sort of sound bad for two days until it recovered, whenever I would travel. It really was temperamental. With this one, I can hear the slight difference when I've traveled, but it's basically immediately playable; it will sound quite good right away." The "Keisewetter" is a little younger than the "Gingold" Strad, though Augustin doesn't believe that is the key factor. "The 'Keisewetter' Strad was made 1723, as opposed to 1683, when the 'Gingold' Strad was made. It's still very old. I don't think it's the age, it's more the pattern," Hadelich said. "Strad changed the pattern. This one is may be just a little more resilient and stable. I think his earlier instruments are a little bit more temperamental… When they have a good day, they sound amazing. But very often they will have a bad day, and then you really have to work twice as hard." Great article! Sounds like a wonderful disc. Does anyone know where I can find any background about Stravinsky and Kochanski's working on this piece? I've read that Alma Moodie was the one to premiere it with Stravinsky on the piano and was curious if there was a reason why Kochanski didn't play it first, or indeed, if the information about Alma Moodie is incorrect. Nice article! In a rush, but I had to write to say that the performance of the Ysaÿe in the video is so beautiful! What a sound! And the effect of the sun rising in the background in way that matches the music is very cool! Indeed, the Aurora, the dawn. Very cool effect! The Suite Italienne link really cracked me up. Scroll down to "albums with full performances of this work." The first entry is titled Damn Hard Music for Classical Violin & Piano. Didn't quite see that coming, but I love that it's out there.